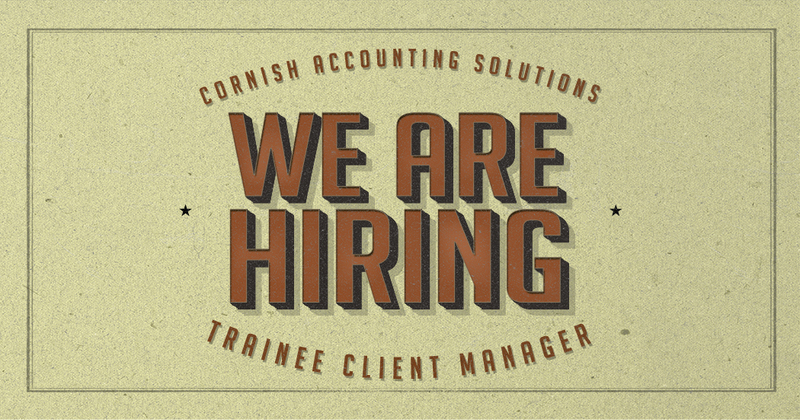 Great news – the Cornish Accounting Solutions team is expanding. We have a Trainee Account Manager position just waiting for the right candidate. Our mission at Cornish Accounting Solutions is to help businesses to achieve their financial goals and business success. We are an award-winning accountancy firm, committed to bringing the very latest in Cloud Based Accounting to our clients. We continually seek to further our knowledge and expertise to benefit our customers. We use the latest technology available and vow never to become the stereotypical ‘stuffy accountants.’ We know that our success relies on our clients’ success and with this knowledge we are invested in each and every business we work with. Building lasting relationships is one of our key values and comes naturally to us. Our customer service is exemplary because our clients are everything to us. This role is crucial to our success. Our Digital Accounting Expert will support our existing team members while we continue to grow as a business. As we grow, we are working towards achieving our goals, and our Digital Accounting Expert will play an integral role in this; managing their own small portfolio of businesses and dealing with all aspects of their accounting affairs; exploring the latest technology available to accountancy; explaining the benefits of cloud based accountancy to our clients; maintaining the close relationships with all of our clients, driving the success and growth of the business. I’m a real people person. I have a natural warmth and get on well with everybody. I understand all aspects of finance and that the position of close trust and intimacy with clients is something not to be taken lightly. I find it easy to empathise and love to get to the root of a problem and solve it efficiently and professionally. I really enjoy working as part of a team and staying one step ahead of those who rely on me – I always have their back. I relish variety and challenge, whether it be preparing a set of accounts, helping clients with Xero queries, preparing a VAT Return, helping team members, preparing a tax return or learning new skills and tech – I would take it in my stride and organise myself to be the most efficient I could be.